I’m still catching up on work, contacting friends, and recorded genre television after last week’s business trip to Chicago. So without further ado, here’s my review for Disney’s latest Winnie the Pooh movie. Fans of A.A. Milne’s stories or Disney’s 1960s and 1970s film adaptations will be charmed by Winnie the Pooh‘s traditional animation style, its gentle humor, and a cast that’s closer to the familiar voices than the hyperactive shorts or TV shows from the past two decades. My sister in law Melinda and several young nieces will no doubt be pleased that once narrator John Cleese (of “Monty Python” fame) begins reading from the book of Pooh’s misadventures, viewers are drawn back to Christopher Robin’s playroom and the Hundred Acre Wood as if no time at all has passed since our collective childhoods. The device is similar to Pixar’s Toy Story. The plot is fairly simple: Pooh Bear goes looking for honey, but his dour donkey friend Eeyore has lost his tail. Pompous Owl, timid Piglet, supportive Kanga and Roo, and nervous Rabbit end up misreading a note from Christopher Robin and look for a monster called “Backson” instead. Sight gags abound, and the script has clever allusions that would likely sail over the heads of younger audience members. Winnie the Pooh lacks the cynicism, off-color humor, or flashiness of many popular movies, but it is better for omitting them. I’d happily recommend this movie, which was rated “G,” to any parent. Not to slight other works, but Winnie the Pooh is the first film in a long time that felt to me like the Disney classics I watched on Sunday nights. I’d give Winnie the Pooh a “B+/A-,” three and a half out of five stars, or a solid 8 out of 10. Let’s hope that Disney can continue shepherding quality to the big screen with its upcoming The Greatest Muppet Movie Ever Made, which also looks to revive popular awareness of clever humor, simple joys, and humane (if not human) entertainment. In related — if somewhat lower-brow — animation, Janice and I have been enjoying the Cartoon Network’s Looney Toons Show, which combines Warner Brothers’ Bugs Bunny and Daffy Duck with the absurd situations of Seinfeld. I’m also catching up on multimedia announcements from San Diego Comic-Con 2011, but I look forward to the upcoming revival of Thundercats, as well as to the return of Young Justice. I’m also impatiently awaiting next year’s Avatar: the Legend of Korra, sequel to the underrated fantasy Avatar: the Last Airbender (not to be confused with James Cameron’s Avatar movie or The Last Airbender movie adaptation dud). In the coming week or so, I’ve got more movies to review, including Harry Potter  and the Deathly Hallows Part 2 and Captain America: the First Avenger! Posted on July 25, 2011 by GeneD5Posted in Fantasy & Steampunk, Movies, TelevisionTagged animation, cartoon, comedy, disney. Despite the decline in live-action TV superheroes, The Avengers: Earth’s Mightiest Heroes is both faithful to the comic books and relatively popular. I’ve already mentioned the cancellation of the campy and fun Batman and the Brave and the Bold, but I hope that Young Justice (whose animation is smoother than most Marvel projects) and defiantly kid-friendly Super Hero Squad keep going. I haven’t watched the latest iteration of Transformers, and it’s too bad that Genndy Tartakovsky’s SymBionic Titan didn’t get the support it deserved. The counterterrorist, anticorporate, and on-the-run take on G.I. Joe is interesting, but I’ve only seen a little of it. Many of the cartoons on the Cartoon Network, Fox, and Nickelodeon aren’t really my style, but I am looking forward to the anthropomorphic animals of the upcoming Thundercats and Teenaged Mutant Ninja Turtles reboots. The Looney Tunes Show is an interesting sitcom approach to the classic Warner Brothers characters, and I wonder whether Seth McFarlane’s revival of The Flintstones can succeed alongside the postmodern sarcasm of The Simpsons and its ilk. In direct-to-video tie-ins, I just picked up Marvel’s Thor: Tales of Asgard, and I’m looking forward to DC’s animated Green Lantern: Emerald Knights, Batman: Year One, and Justice League: Doom. Between live-action movies, video and TV, and of course comic books, it’s no surprise that several role-players in my groups have asked about D20 Mutants & Masterminds 3rd Ed. or Icons! Fellow Game Master Jason E.R. may run a one-shot of Dark Pages this coming summer. Coming soon: Horror and fantasy TV and games! Posted on May 25, 2011 by GeneD5Posted in Comic books & superheroes, Games, TelevisionTagged animation, batman, cartoon, comedy, mutants & masterminds. This past weekend, I met fellow blogger Thomas K.Y. and role-player Josh C. at Thomas’ condominium in Lexington, Massachusetts. We watched Megamind on DVD. I liked the superhero movie more than I expected. Although it’s part of a recent glut of computer-animated comedies focusing on villains turned heroes — including the Shrek franchise, Igor, and Despicable Me — Megamind respectfully spoofs comic book conventions and has a sharp script. The film has numerous allusions to its inspiration but still feels fresh, reminding me of one of my favorite Pixar works, The Incredibles. 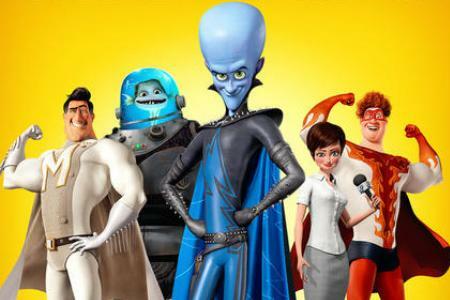 Megamind also features a strong cast, including Will Ferrell as the self-absorbed titular alien, Brad Pitt as Superman knockoff Metro Man, and Tina Fey as intrepid reporter Roxanne. The supporting cast also has fun, with David Cross as fishy sidekick Minion, Ben Stiller as museum curator/alter ego Bernard, and Jonah Hill as protégé gone wrong Hal Stewart/Titan. I wasn’t distracted by the celebrity voices, but it helped that I watched the film long after any promotional hype. Unlike the “uncanny valley” of Robert Zemeckis’ animation, the cartoony yet realistic style of Megamind and movies like Cloudy With a Chance of Meatballs, How to Train Your Dragon and Legend of the Guardians: the Owls of Ga’Hoole doesn’t bother me. Megamind‘s action scenes were well-choreographed, and we’ve come a long way from the original Tron or ReBoot (whose complete series is finally available on DVD). I’d give Megamind, which is rated PG for language and violence, a solid B+, 8 out of 10, or three stars. Although I’m still a fan of “traditional,” 2-D animation, I do enjoy the best of the new wave, even if I haven’t yet seen Toy Story 3 or Tangled. I hope to screen the anthropomorphic animals in Western comedy Rango this coming weekend. After lunch at Watch City Brewing Co. on Waltham’s Moody Street, Thomas, Josh, and I watched Alien vs. Ninja, which is just as silly a “B” movie as the title suggests. Janice and I also ate at regular haunts Comella’s, Acapulco’s, and Wild Willy’s this past weekend.